A Cobb Salad Pizza?? Seriously?? 2. Unroll dough on a baking sheet coated with cooking spray; pat dough into a 14 x 12-inch rectangle. Lightly coat dough with cooking spray. Bake at 425° for 8 minutes or until golden. Remove from oven; sprinkle evenly with 2 tablespoons blue cheese. Set aside. 3. Combine oil, balsamic vinegar, mustard, and 1/8 teaspoon pepper in a large bowl; stir with a whisk. 4. Cook bacon in a large nonstick skillet over medium heat until crisp. Remove bacon from pan; crumble bacon into oil mixture. 5. Add chicken, tomatoes, and onion to oil mixture; toss gently to combine. Add greens; toss gently. 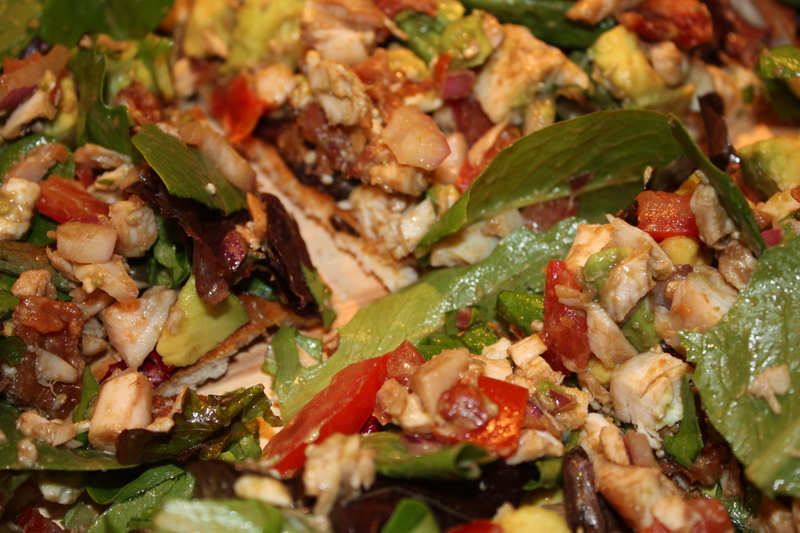 Top crust evenly with chicken mixture, avocado, and remaining 2 tablespoons cheese. Cut into 8 pieces.